Unified Metric System Principle: as space dimension time is space: because space increases/decreases infinitely therefore any different from space its zero-dimensional divisor the time by definition of its 0 geometric/algebraic quantity does not exist (not occupying thence not affecting space, volume as velocity), physically what is perceived as time used as meter in any (space/speed) phenomenal science, geometry and algebra – is the same positive space length λ (or L) as, or equal to, positive geometric period (moment, continuum) of length existence (literally length as/of length, or λ/λ=λ); and indeed, as Σ=s=λ=c=v=a=+1=∞=variable=constant this period is equal either (inversely) proportional to space, speed or any positive geometric quantity or value – and that proves e.g. current metric system (or any system) in physical reality to be homogeneous unified one (spacetime s/t=s/s; m×a=s×s; 1/2=s/s etc; e.g. 1 second (in Earth rotation) as period and length (volume as velocity 1=∞=any1, as/in 1 Space) is equal to 1 year - and to any period); any theory – correct rational physical reality; or equates time change, dilation to volume as velocity acceleration; etc. The current Standard (sciences) Model only works (in short scale) because its 0 is not impossible that but infinitesimal +1 – any different non-existent 0 cannot be measured/observed/expressed thus physically doesn’t function. If any 0 dimension (of time) did not exist as in reality s=+1 (infinite decrease), it would not be feasible for invention (discovery) or any expression; but as existent spatial matter, it is used and can be exchanged for any data or numerical symbol. Analysis of any measurement (quantity, number): e.g. time, frequency, density, mass, force, pressure, 0 (dimension) etc. shows that any such is constituted only by positive length L or λ (even infinitesimal, as infinite decrease a) i.e. also equal to space, volume as velocity, kinetic energy Σ=+1=∞=any1 . Examples therefore: s=λ=v=c=a ; c=v×d ; t=s ; v=d/t=s/s ; a=v/t=s/s ; f=1/t=∞/∞/t=c/λ=s/s=1=∞ ; ρ=m/s=s/s=adeceleration ; m=ρ×s=s×s=adeceleration ; F=m×a=s×s=adeceleration ; G=s=adeceleration ; K=H=W=R=w=r=s=+1=∞ , etc, as well as any of above are equal s=+1=∞ . As in physical reality positive spatial (feasible for any expession) spectrum: point, dot, linear, plane or any dimension 0=sinfinitesimal=adeceleration=1/∞=+1=∞ ; any geometric/algebraic/physical quantity (fraction, complex, multiple, separate, different, negative etc.) is –∞…∞=s=+1=∞ . Σ=G=s=λ=c=v=a=+1=∞=any1=variable=constant . Index: s kinetic energy volume, space; Σ any (kinetic) energy; v velocity as velocity value; d , λ distance, (wave)length; c constant, speed of light; a change, acceleration; G gravity (kinetic energy of gravity); t , f time, frequency; ρ density; F force; m mass; “limited”: short; K temperature; H heat; w power; R resistance; W work; r velocity ratio. 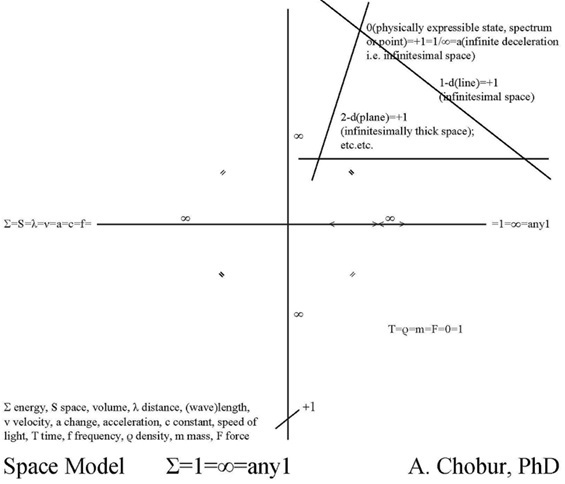 Space Model Diagram; examples; full version edited in Microsoft Word, Adobe, etc. of Physical Quantities Analysis "Time = force" (eponymous Site entry) are available upon Your request: alexchobur@hotmail.co.uk Any format distortions on Site are due to constant upgrade of servers. There is no fixed form in the world, or Universe. Any matter proves to be changing – thus consisting of change as only one element; the change is motion, travel, speed, acceleration, velocity – and velocity is volume, space. Any velocity is any volume, any velocity or volume is any one: any size (dimension or measure, length), shape, form, geometry, constitution, spectrum, quantum, state, object, body, matter, energy is equal. Any state of matter in Universe is equal to +1 (energy conservation law, where + means positive, i.e. existing, real matter). With revolution of Earth; its motion around Sun; motion of solar system in galaxy; motion of galaxy in infinity of such – the Universe expands, velocity equally to volume constantly grows – and travelling in infinite space with therefore the same infinite velocity, any body or spectrum (constituted by same velocity or space) in any positive geometric period (i.e. same constant or continual space) occupies total infinity; as far every body, spectrum in Universe behaves this uniformly, every particular, individual body, spectrum with absolute precise equality (infinity is precise number, having no physical zero-dimensional borders it is neither less nor more than only 1 itself) of size, shape, form, geometry, constitution, spectrum, state – occupies any body anywhere in space or Universe as the same body. Physically, the Sun is in coffee cup and v.v, Earth is the Sun, a person – is a galaxy, anyone and the world; motion of a hand, travelling in space, changes its total infinity – equally as light of just one star, changing, occupies and changes all the Universe, or one spoon of salt changes total chemistry of ocean – if it was less or unequal in any parameter, including power, it would not be capable of that (butterfly effect, or micro-quantities theories). Any (direction) vector from any body or its part in space infinity is equally infinite; any body either its part is positioned exactly as/in same one non-zero spatial infinity centre; in present infinite coordinate system of our world any spectrum or body has exactly the same shape, geometry, size and position: everything in same one place therefore equal as/by state or constitution. Infinity is that of any one individual spectrum: being equally infinite in any parameter or property, any matter or spectrum is endless (unstoppable, undestructible, deathless non-degradable integral) – indeed in agreement with energy law. Endlessly, continually changing matter is constantly the same – literally any matter as change changes into the same form of change, that is universally liquid motion – having no fixed, limited, stopped, unactive, hard, dense form; increasing, accelerating it equally decreases (gravity), and v.v. (compensation theory). Universally infinite velocity is sufficient for acceleration of any individual spectrum or body in/to any one – thus e.g. anyone’s knowledge or information is absolute, or equally infinite: space infinity, equally to any constituting it spectrum, finding no zero-dimensional border, expands, accelerates, vibrates, increases equally to its decrease – infinitely: it is the same small as large; part is whole, matter is its property; proportion 1/1 of decrease and increase in/out individual quantum or spectrum provides its unique – equal to any 1 – geometry or state, organization.